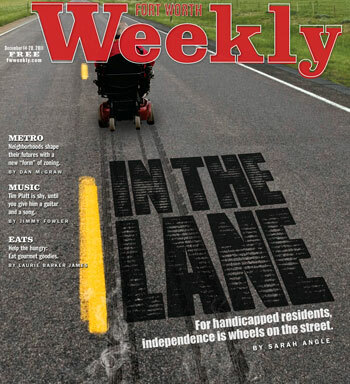 For handicapped residents, independence is wheels on the street. Larry is hard to miss. The 68-year-old is a big guy who gets around the streets of Fort Worth mainly in his motorized wheelchair. But on Dec. 10, a Fort Worth bus turning onto University Drive from White Settlement Road didn’t see him at the crosswalk. He said the bus missed him by just two or three feet. “I was so scared … I just went into the 7-Eleven and sat there to gather my thoughts,” Larry said. He suffers from osteoarthritis, and when he falls out of his chair, he has to call 911 and get emergency responders to pick him up. The last time he fell, he broke his hip. That was a year and a half ago. Unfortunately, this isn’t the first time Larry has come face-to-face with a moving vehicle. Four years ago he got hit by a Volkswagen while crossing the street at Camp Bowie Boulevard and Hulen Street. The car knocked him out of his chair, and he fell flat on his face. The driver of the car stopped and helped him, and they exchanged information. He settled with the driver’s insurance company for about $5,000, plus medical treatment for an injured neck. The combination of wheelchairs and cars on the streets around Casa and nearby apartment complexes where other wheelchair-riders live can be heart-stopping for drivers of both the chairs and cars. In many places in the neighborhood, there are either no sidewalks or no curb cuts. So the wheelchairs, doing a few miles an hour, frequently share the street surface with cars. In places where intersection angles limit a motorist’s view of what’s ahead, the combination can be dangerous. Mobility in its various forms is an issue for many Casa residents, and there are safer transportation options available to Casa residents, free or for a nominal fee. Still, residents who can do so often choose to go it alone. Their wheelchairs are a frequent sight in the neighborhoods just north of the big University-Camp Bowie-7th Street intersection. Kimberly, 49, said she rides the bus but has been using her motorized wheelchair for the past 12 years for shorter trips around the city. She suffers from deterioration of the spine, which prevents her from walking. But “life must go on,” she said, and so far, she’s been lucky — or vigilant — enough to avoid an accident. Larry and Kimberly acknowledge that riding alongside speeding traffic can be dangerous. But they prefer it to MITS (Fort Worth’s Mobility-Impaired Transportation Service) or the Fort Worth bus system, The T, because it’s faster and more flexible. There’s another reason, too, perhaps the most important one. Motorized wheelchairs provide these Casa residents and others with something that’s as precious to them as whatever item they go to shop for: a degree of independence. Susan, Fiona’s owner, rewards the dog with a good petting, and the fluff of white fur plops back down on the lobby’s tile floor. Susan turned 60 earlier this month. “But let’s just forget about it,” she said. Age, that is. “I just turned 70 this month,” said a woman rolling up in a motorized wheelchair and red sweatpants. Her name is Phedalia; it means wildflower in the Cherokee language, she explained. On this day, the lobby is like reality television without the cable bill. It’s populated by Casa residents zooming in and out of the front door on scooters, a community room full of art students, folks waiting for the bus, and a few visitors. The chatter of memories mixed with current events from the Senior News provides a buzzing backdrop. 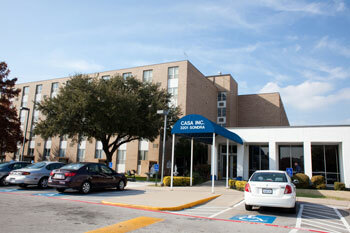 Catholic Charities operates two similar buildings in Arlington and Stephenville, but Casa is the group’s biggest and oldest facility of its kind, with a total of 200 apartments. 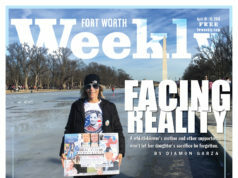 A handful of other nonprofits also provide housing for low-income elderly and disabled throughout the city, including the Salvation Army’s Catherine/Evangeline Booth Friendship Houses, of about the same size, and smaller facilities run by B’nai B’rith International in southwest Fort Worth and the Volunteers of America, which operates the Park Meadows apartments in east Fort Worth. Fort Worth is home to a large elderly, low-income population, explained Monica Quiroz, Casa’s executive director of housing. So places like Casa are in high demand and usually have a waiting list. The wait time to get into a Casa apartment can be up to four months; residents must be 62 or older or be a disabled adult. Casa qualifies for the federal government’s Section 8 program, and rents are subsidized. Most residents live on incomes at least 50 percent below the poverty line. Once in, folks tend to stay: The average length of residence is about 10 years. 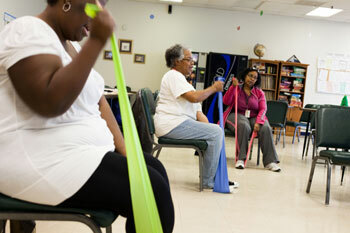 Right now, about 75 percent are elderly. Casa is neither a nursing home nor an assisted living center. There is no on-site medical assistance. 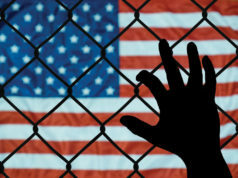 “People have to be able to care for themselves,” Quiroz said. Each apartment has a kitchen, and the complex offers a library, laundry facilities, a new computer lab, and a landscaped courtyard where cookouts and other events are held in mild weather. What it doesn’t provide is cafeteria services, although Senior Citizen Services of Greater Tarrant County Inc., offers breakfast and lunch five days a week for a small donation. That means residents need to get out of the building regularly either to eat at local restaurants or buy groceries. Some residents have cars, and many take the regular bus or a MITS van to go shopping and to do other chores. For those like Kimberly and Larry, who choose to get around in their wheelchairs, safe passage in the neighborhood is far from perfect, but getting better. Kimberly said she finds the main problem to be a lack of curb cuts giving access to sidewalks, rather than a total lack of sidewalks. Without access, “you have to back up or go into the street,” she said. 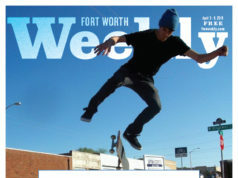 “We call and call the city to get more ramps. But that’s been years, and nobody has done anything about it,” said Larry. One bright spot, he said, is the Camp Bowie and Montgomery intersection, where wheelchair ramps are now excellent. “They really fixed it up,” he said. However, the message that more curb cuts are needed may not be getting through to city hall. According to city public affairs officer Bill Begley, there is no record of requests for ramps or sidewalk improvements in the area surrounding Casa. Sidewalk maintenance is up to the adjacent property owner, he said. The city does set aside some money each year from red-light camera revenues for such improvements, but the list of requests for that funding is a long one. Begley said the list is prioritized according to “high pedestrian needs,” which would seem to push Casa toward the top of the list — if it were on the list at all. Wheelchair riders shouldn’t hold their breath: Begley said that even if a ramp request were fast-tracked, installation would still take anywhere from three months to a year. More ramps wouldn’t help prevent the kind of accident that almost happened to Larry. He reported the incident. The T spokeswoman Joan Hunter said Tuesday that the operator of the bus “did not pose a risk” to Larry. “She [the bus operator] had a green light as well,” she said, but added that someone from the bus agency would call Larry about the near-accident. Larry’s not sure how much more he’ll go out with his chair now. “I almost got killed,” he said, which makes him think twice before crossing the street or even heading down the road to Braum’s. RoShawn, 31, is one of the facility’s youngest residents. She’s been living at Casa for two years and is proud to be on her own. She qualifies for residency based on disability. “Sometimes you gotta live by yourself. You can’t depend on no man or your momma,” says RoShawn, who spends extra time this morning arranging her thick black hair, since a visitor is going to ride the bus with her. 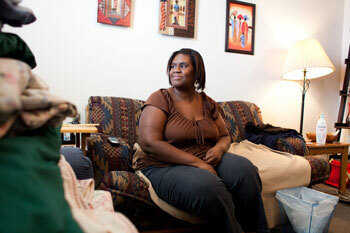 RoShawn doesn’t drive, so her lifeline to independence (and shopping) is the Fort Worth bus system. And she’s a pro. It’s the coldest day of the year thus far, and we’re standing at the bus stop right outside Casa. I’m a bus-system rookie, but RoShawn is a first-class guide. We’re taking the Route 10 bus down to SuperTarget and the Dollar Tree store, both located in the Montgomery Plaza shopping center that fronts on West 7th. Because of her income and disability, she qualifies for a free pass from the Fort Worth Transportation Authority — and it includes one guest. The bus doors open, and RoShawn gets on, hugging and saying hello to a woman already seated inside. We make about four stops before arriving at Super Target. (RoShawn has brought a black rolling cart to carry her purchases.) Our mission: Get a snack at the SuperTarget café, then walk down to the Dollar Tree to get prizes for Casa’s weekly bingo night. RoShawn has her cash neatly organized in a white envelope. Casa’s full-time social worker provided the money when RoShawn volunteered to go get the prizes. Detergent, toilet paper, bar soap, and hand soap are bagged and put into RoShawn’s rolling cart. She knows the schedule and says we can enjoy about five more minutes of warmth inside the Target store before we have to go out to catch the bus back to Casa. “It comes at 1:30,” she explains, and when it’s time, we cross a busy side street and huddle on the sidewalk until the bus pulls up. “Do you think I can drive an automobile?” Rupert asked with a knowing grin. He came to Casa six years ago, two years after a stroke left him disabled and partially deaf in one ear. He walks slowly, and one side of his body shows obvious signs of weakness, even months after physical therapy. We were sitting in one of the common areas inside Casa, a space where residents can mingle and relax. Each of the building’s five floors has one. Even though Rupert, 76, wears a bright green and orange Astros baseball hat, he’s a diehard Rangers fan. He just likes the way that hat looks on his head. And yes, he still drives: a truck. But he knows that won’t always be the case. “The day is coming when I can’t drive anymore, but until then, I’ll be driving,” he said. Every Monday at 7a.m. he goes to Wal-Mart to do his weekly grocery shopping. He beats the crowd and gets to pick from a long line of scooters. He doesn’t like to cook, so he eats a lot of TV dinners. And he frequents the surrounding fast-food restaurants like Braum’s, Jack in the Box, and Chick-fil-A. A member of All Saints Catholic Church for more than half a century, he also drives to church every Sunday. Like many residents at Casa, Rupert’s thankful to have a place to live. But financially, he doesn’t have much of a choice. After 44 years of marriage, six kids, 16 grandkids, and 10 great grandkids, Rupert got a divorce. And the divorce settlement left him with close to nothing, he said. Still, he considers himself lucky, especially compared to many of his friends who live elsewhere and are bedridden and can’t drive to the grocery store or hit the fast-food window at Jack in the Box. When he feels like he can’t drive safely anymore, Rupert said, he’ll get his family members to take him grocery shopping and to church on Sunday. But for now, he’s enjoying his life behind the wheel. “I’ll cross that bridge when I come to it,” he said, adding that he doesn’t want to put anyone at risk, including himself. Juana doesn’t have much time for small talk. The Puerto Rico native is painting a Christmas card for her granddaughter, and she’s got to get it “perfect.” Juana jingles as she raises her hand and calls out another question for Lucy. She’s decked out in a bright red and green Christmas vest, red plastic-framed glasses, and matching bell earrings. She said she’s trying to spread some of the Christmas spirit. “Ms. 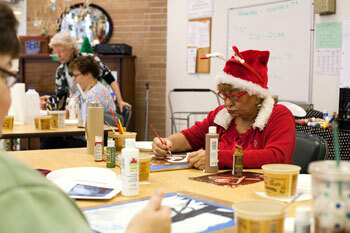 Lucy” is the instructor for this handful of art students at Casa, doing what she’s done for 30 years. She wears a long smock and glasses and has short blonde and gray hair. She got her start as a teacher in Germany when her husband was stationed there. She whips around the room, gliding effortlessly from student to student. It takes a few seconds for a visitor to notice Lucy’s crutches — which are seamlessly integrated into her every movement — and her missing leg, lost to cancer 26 years ago. 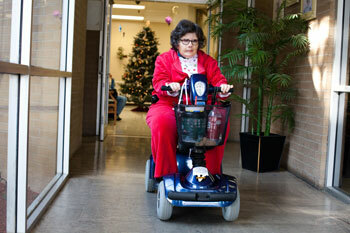 A Casa resident, she drives her own car. Lucy displays a photograph on her cell phone of a painting by one of her Casa students. It’s impressive. She scrolls through all of her students’ work. Sally, 64, has been living at Casa for the past 12 years. “Every February I ride my scooter to the stock show. Sometimes I go to the science museum. I call it [the scooter] my car — makes you feel independent,” she said. Right now she’s sitting in the community room with Quiroz, working with purple yarn on a plastic loom. “She makes excellent potholders,” says Quiroz. Most Saturdays find Sally rolling down the sidewalks of West 7th Street. She usually visits SuperTarget or the Dollar Tree. Casa doesn’t provide scooters or motorized wheelchairs for residents, but its social worker helps fill out the necessary paperwork to get Medicaid or Medicare funding to pay for them. Because of her mental disability, Sally qualifies for MITS, which provides the disabled with door-to-door transportation throughout Fort Worth, Richland Hills, and Blue Mound. At Casa, MITS helps residents get to appointments at doctors’ offices that may be located across the city — too far for a scooter or motorized wheelchair ride. “Sally is a big advocate for being independent,” Quiroz says. Sally lived with her mother before moving into Casa. Her mom didn’t think she could handle living alone, “but she proved she could do it,” says Quiroz. Sally’s thick glasses magnify her large eyes. She’s wearing a bright red velour track suit with a white Christmas turtleneck. Monica is losing her voice, and Sally tells her she needs to wear a turtleneck to keep warm. She likes to quote part of the Catholic Charities mission statement, which she has memorized. 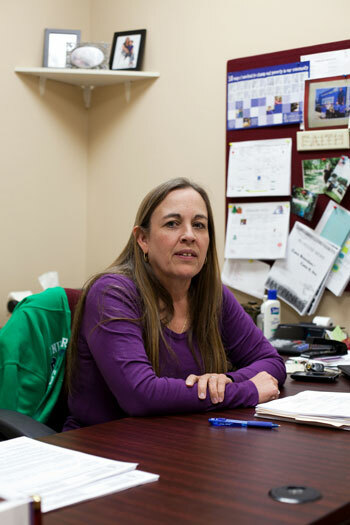 “They help people who are abused, mistreated … and they promote justice,” Sally says. She remembers a lot of the stuff she had to part with when she came to live in her small apartment at Casa. She turns to Monica. “Where are we going tonight?” she asks. “Wherever your dreams take you,” Quiroz answers.